Mammal Mondays: Welcome to Camel Monday! 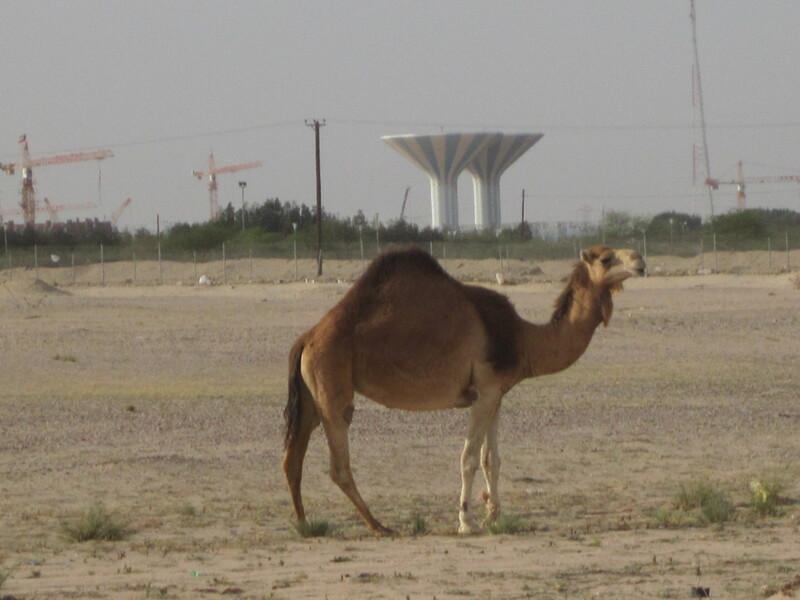 I can’t very well take a trip to a city on the edge of a massive desert without writing about some of the local wildlife, can I? While driving to an outlying city for lunch, which involved a large, scary highway and mile after mile of sand and rubble, The Electrician’s mom hollered, “There! Camels!” Immediately, The Electrician’s dad slowed down, threw the truck into 4×4, and pulled off onto the shoulder of the highway. Just so you know, the shoulder of the highway in a desert is basically an expanse of mini sand dunes. 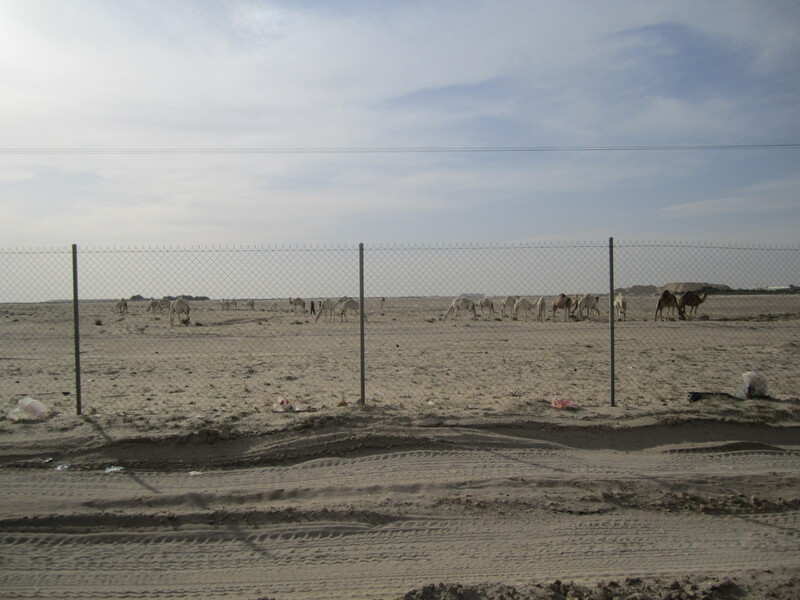 There, behind the 8-foot chain link fence that borders the highway, a herd of camels were grazing on whatever edible vegetation they could scrounge. Pulling off the highway. I was pretty excited at this point. I’m not sure what the actual term for a peaceful group of camels is, but we’re going with “herd” because it makes sense. 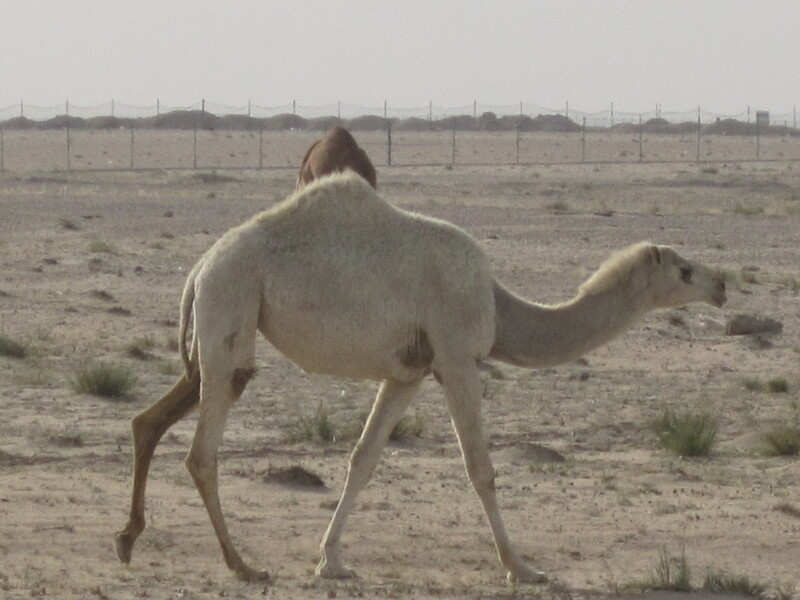 Also, there were two fellows we’re going to call camelherds (like shepherds, but more hump) taking care of the camels and moving them about with long whips. I’m not sure what the objective is of shuffling a group of camels around a dry, sandy area with no obstacles except the highway, which is sectioned away from the “pasture” by a fence. 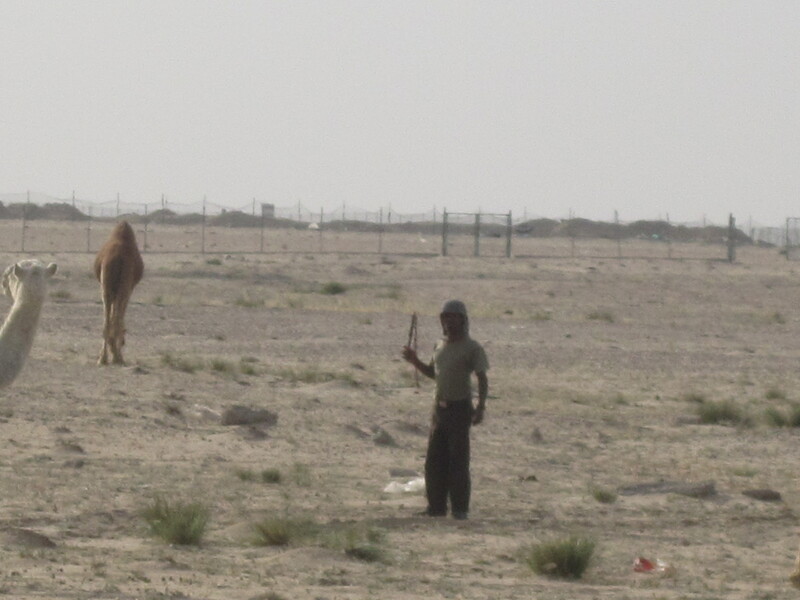 Perhaps Joe’s only motive is to keep the group together, even if a person could see a stray camel for miles out here. Mr. Camelherd number one. His friends call him Joe. Camel races were playing on television when we were stuck overnight in Abu Dhabi. I found out once we were here that the camels don’t run with jockeys on their backs because they have mechanisms strapped to them that smack them repeatedly with little whips. Humans are therefore unnecessary to make the camels run, and would just add extra weight. Here are more shots of “our” non-racing camels, who looked quite content despite the lack of snacks out on the sand. I suppose they don’t know what they’re missing. Just once, I’d love to see the look on a camel’s face if it was turned loose to munch in an Alberta pasture. The desert is all very, very beige, including the wildlife. Because I was shooting through the holes in a fence, these shots aren’t as great as they might have been if I could have gotten up close. Considering how big camels are in person, I felt better with the fence between us anyway. Those big martini glasses in the background collect precious water. 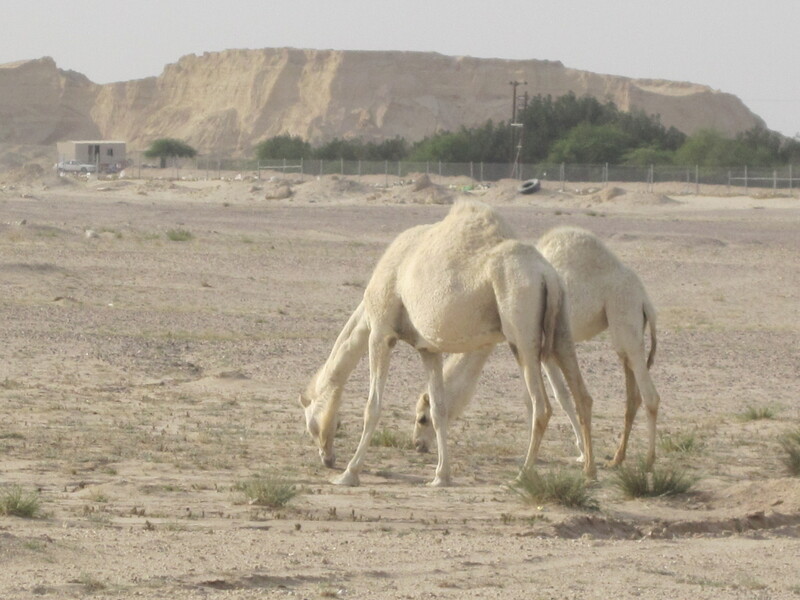 There were three shades of camels in the background, white, brown, and black. I tried to get the black one in a shot, but it was smaller (perhaps younger) than the others and kept hiding behind its dromedary brethren. I see these guys as the labrador retrievers of the desert: they are available in black, yellow, and chocolate but are shaped identically. And so, folks, the most unusual critter featured so far on a Mammal Monday. Thank you, camels, for deciding to forage close to the road yesterday. Even if those little whips don’t hurt physically I’m sure they hurt their pride. Alas…….well, I believe my next life will be much different than this. I feel sorry for the racing camels. I hope they are treated well otherwise!